Yesterday we visited different Phoenix Zoo exhibits than we viewed the previous Sunday. Just inside the Arizona Trail section of the zoo we watched two snowy egrets interact with three different species of iguanas. The black-tailed prairie dog community was actively enjoying the warm fall day. The burrowing owl was camouflaged against a log. Two collared peccary scrounged for lunch. We moved to the Tropics Trail where we viewed two Komodo dragons born in January 2013. We learned that both Ivan and Gaia had died of old age. Interesting fact: a female Komodo dragon can give birth to offspring without fertilization from a male; the process is called parthenogenesis. A Chinese alligator took advantage of the outdoor water pond in the Komodo dragon exhibit. Multiple birds such as crowned pigeons, a ferruginous duck, straw necked ibis, and chestnut-breasted molkola were active in Tropical Flights. 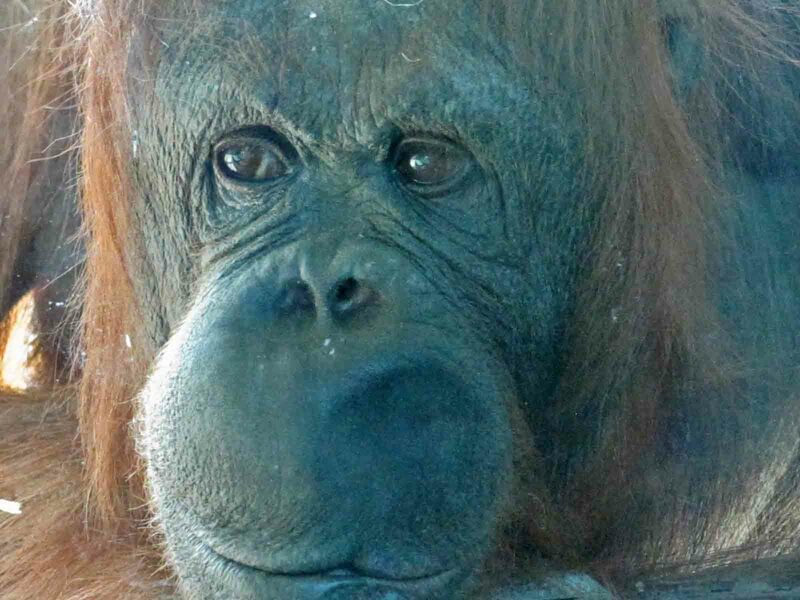 Bess, one of the orangutans, posed near the glass window while baby Kasih sprawled on his back under a rope net. The zoo was much less crowded with humans this week. 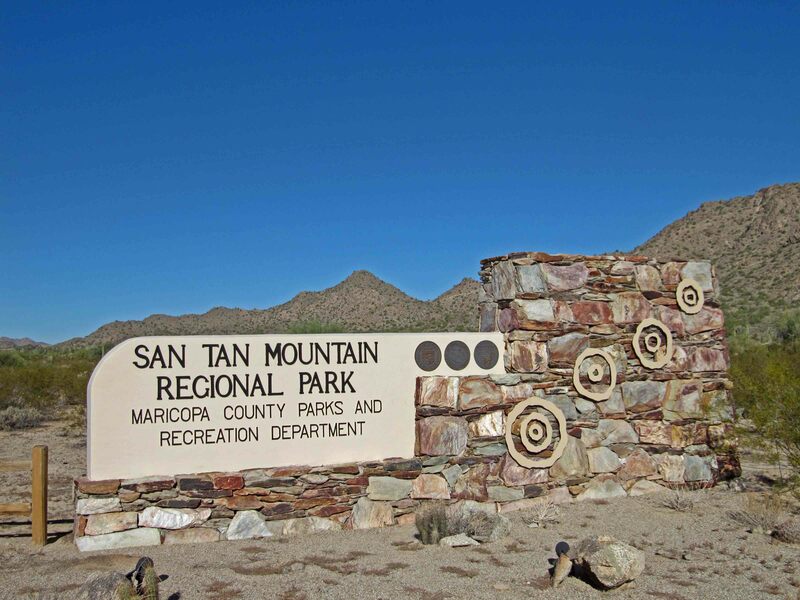 The San Tan Mountain Regional Park is located in the east valley of metropolitan Phoenix and northern Pinal County. Established in 1986 through a cooperative agreement with the Bureau of Land Management and an intergovernmental agreement between Maricopa and Pinal Counties, this example of Sonoran Desert consists of 10,198 acres. A road runner posed near the entrance sign. We hiked in a counter-clockwise loop along the following three trails: Goldmine (1 mile), San Tan (1.4 miles), and Moonlight (1.2 miles). The relatively flat trail is about 1,400 feet above sea level with good views of Goldmine Mountain and other surrounding mountains. We encountered a few other hikers and mountain bikers. A half dozen equestrian enthusiasts completed their ride on two other trails simultaneously with our exit on this blue sky day. Many Phoenix Zoo employees and guests dressed in Halloween costumes today. Some animals interacted with pumpkins as others frolicked on this beautiful fall day with temperatures in the low 80s. Several reticulated giraffes reached high for their food. A Thompson’s gazelle grazed behind one of his long necked friends who assumed a curtsy position to nibble on greens. Two bighorn sheep posed atop a Papago sandstone butte. 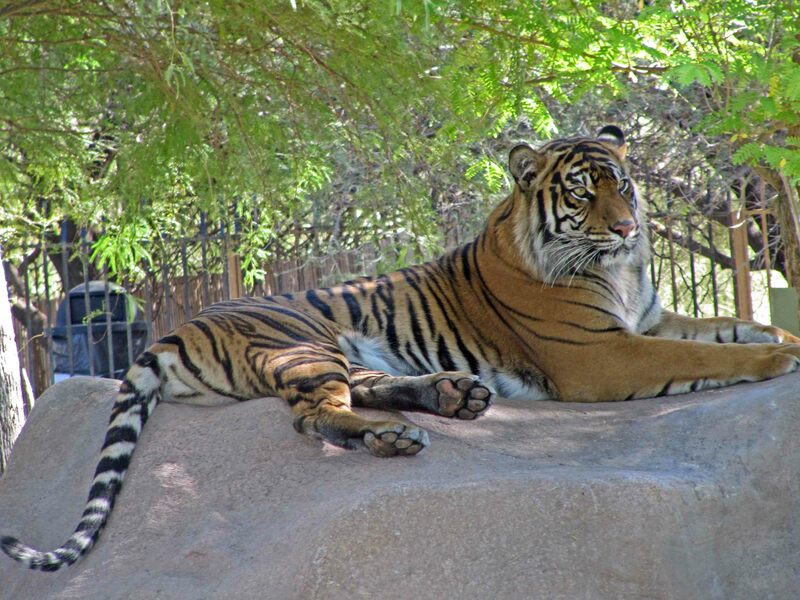 After the Sumatran tiger completed a walk around his open space, he climbed on a flat rock to watch the passing pedestrian traffic. Only a couple of meerkats were out as two rabbits played with one another. How did they get there? A mandrill stuffed his colorful face with pumpkin seeds. Next door two Hamadryas baboons peacefully slept against the cool rocks next to a window. The rhinoceros iguana guardedly eyed those looking at him. Three orangutans played with one another. What a treat to visit the zoo! Our first Phoenix Symphony performance of the season was conducted by Hungarian Gregory Vajda. His sense of humor and exuberance played well with the nearly full house. Three 20th century composers who transferred folk traditions into Western classical music were featured. Béla Bartók orchestrated five of his early piano pieces into Hungarian Sketches. “An Evening in the Village” contrasts a slow dance with a sprightly one that imitates a peasant playing the flute. “Bear Dance” conveys the deep sounds and heavy rhythm of a farmhand’s dance. “Melody” is based on a mournful lyric theme developed on the woodwinds which grows in intensity as more instruments enter before subsiding again. “Slightly Tipsy” has a wavering melody, irregular rhythm, and abrupt changes in mood. “Swineherd’s Dance” is a lively folk dance highlighting the flute and piccolo which gets wilder and wilder until quietly receding. Russian born Philippe Quint was the violin soloist for Violin Concerto in D minor, Opus 47 by Finnish Jean Sibelius. This work exhibits every known technical difficulty. The audience thundered its approval after the first movement which uses evolving sonata forms. The principal cadenza at the end of the movement is based on the opening theme and reuires spectacular technical virtuosity. Quint, playing the 1708 “Ruby” Antonio Stradiveri violin on a three-year loan from the Stradivari Society, did not disappoint. Our sixth row seats in front of this guest artist allowed us close views of this special instrument with a rich, ruby tinted varnish. After an intermission, we heard Sibelius’ famous tone poem symbolizing Finland’s nationalism, Finlandia, Opus 26. The final selection was by Hungarian Zoltán Kodály, Variations on a Hungarian Folksong. “The Peacock,” the text Kodály used for this piece, was a symbol of Hungarian freedom. The work consists of an introduction, sixteen variations, and a finale. A great evening of music! The Almosta Trail is located 12.5 miles from Iron Springs Road on Williamson Valley Road. The north side of Granite Mountain took the brunt of last June’s Doce fire and the Williamson Valley Road offers good views of the damage. Fortunately, all the homes adjacent to the burn area were saved. The Almosta Trail takes its name from the access road that was whimsically named when it was out in the boondocks. Now a couple of large homes are situated on the south side of the trails’ start. After the first 0.4 mile one goes through a gate which has a half mile of trail with ten feet for trail situated between barbed wire fences, apparently because none of this trail is on public land. The trail winds down through Whispering Canyon to the riparian corridor of Mint Wash. On my hike in I took a side trail which required crossing this small stream three times. The turn-around point is a gate by corral that junctions with Trail #622. The Almosta Trail is popular with equestrians as was evidenced by the tracks, and on my return two women on horseback passed. This 4.5 mile moderate hike starts at an elevation of 5,070 feet and its low point is 4, 780 feet with many ups and downs. Another great fall hike! 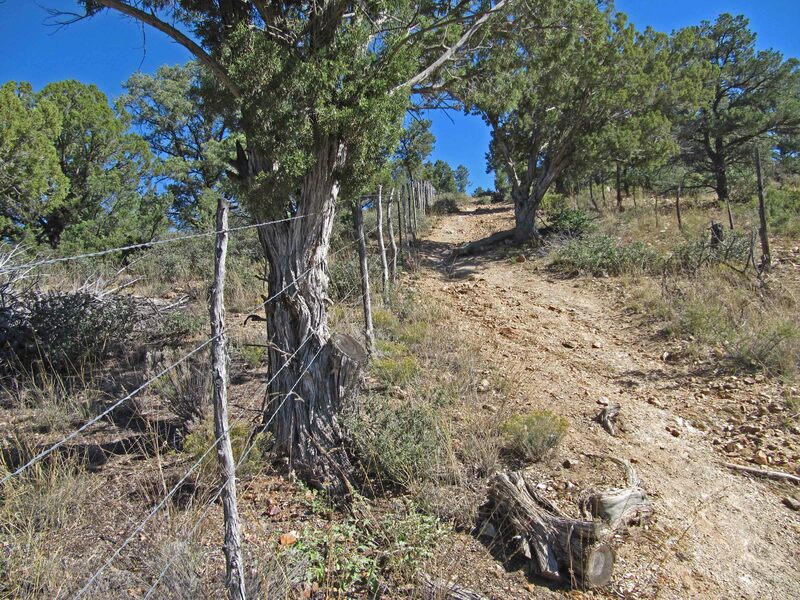 The Javelina Trail #332 south of the Iron Springs Road trailhead follows the bed of the Peavine Railroad which connected Prescott to Phoenix from 1895 to 1962. A new route was built from Paulden to Skull Valley which bypassed Prescott. The rails, ties, and spikes were removed in 1962. The old reddish clinkers that acted as ballast for the rails are still visible at the edges of the trail. Initially the railroad bed served as a forest road. Later it became a trail and part of the Prescott Circle Trail. 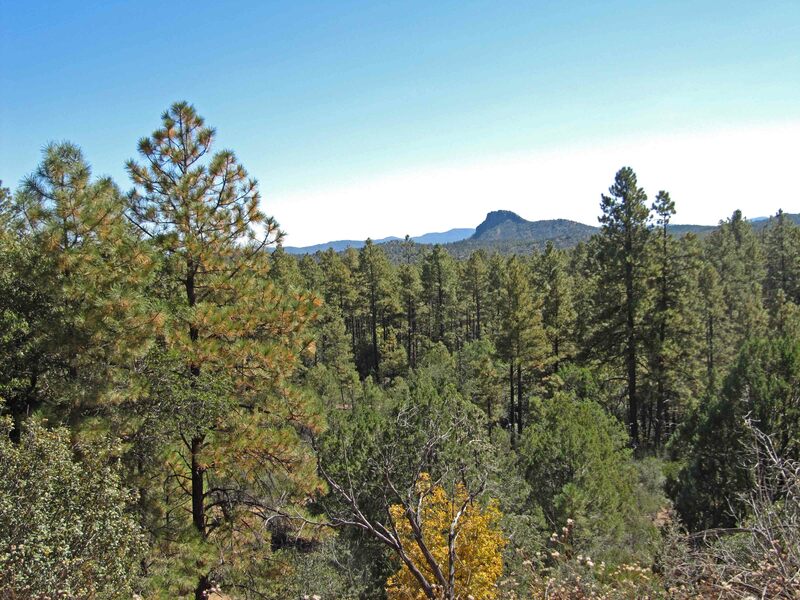 Some of the trail is open and offers views of Thumb Butte and other parts of the trail are shaded by tall Ponderosa pines. Near the end of the trail is a chimney ruin. The turn around spot at 2.2 miles is an old corral. The trailhead descends from 5,920 feet to a low point of 5,670 feet. Two women on horseback passed me on my return. A fenced in pumphouse building sits on the south side of the trail 1.2 miles from the Iron Springs Road. Several years ago I hiked to this point from the Thumb Butte trailhead. Also, we previously hiked this trail from the other side of Iron Springs Road to the Granite Basin Road. It was a good day to explore another segment of this trail.